This post is part of a series of stories from my 2018 trip to Iceland. Click here for all posts. And then you’ll look at a map. And you’ll realize ALL THAT is to be found in a pretty compact area of the country. 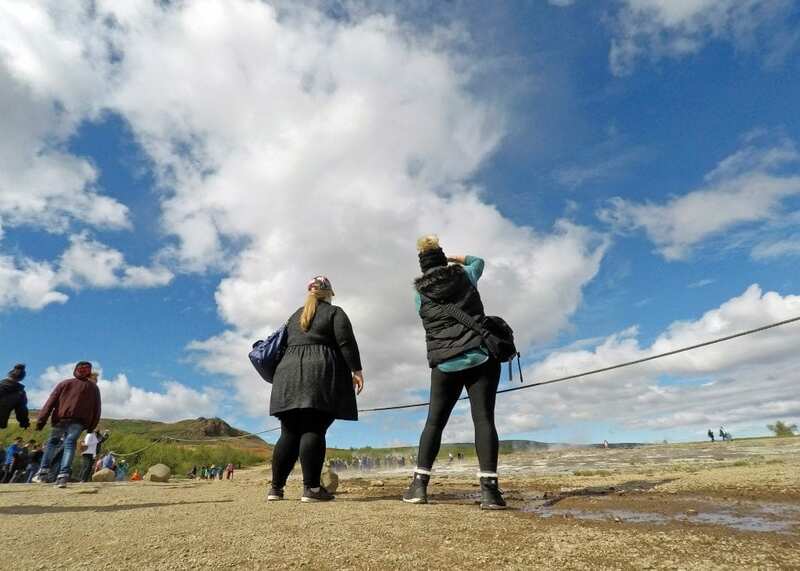 Believe it or not, every breathtaking thing considered part of The Golden Circle is accessible in a single day — tour buses leave Reykjavik every morning and do the loop in 3 or 4 hours. 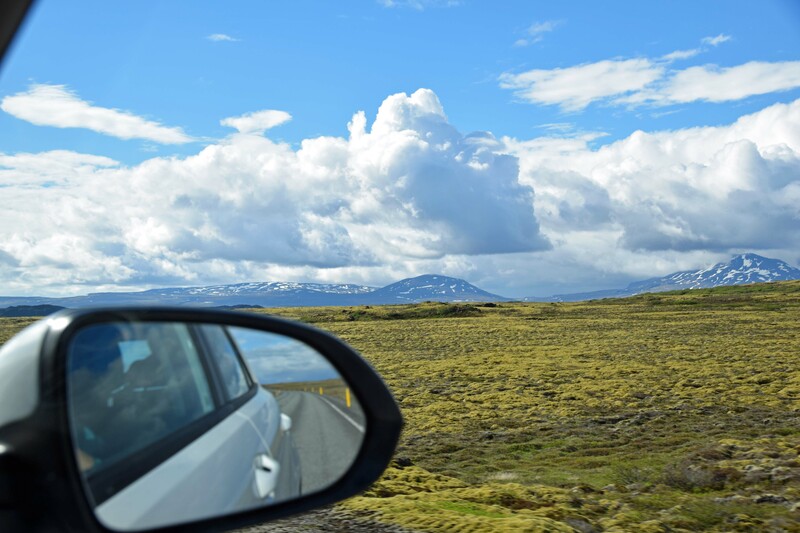 The Golden Circle is not the name of the road or a perfectly defined route, but there are several natural wonders generally considered to make up the “circle” that begins and ends in Reykjavik. We didn’t do it in a single day and we didn’t do it “in order” but we visited some of the more iconic spots along the circle. Looking at that map now only reinforces my intention to get back to Iceland someday. There’s always more to see! These are the stops we made along the circle. 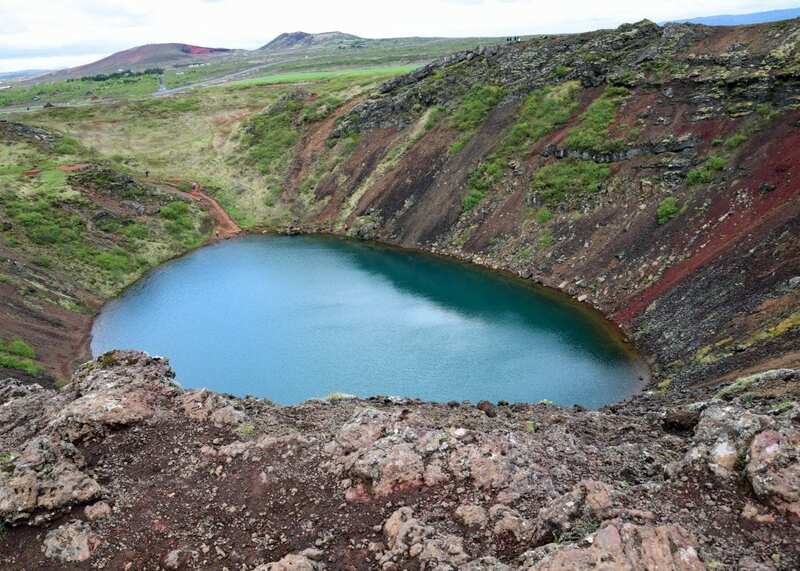 Kerið – or Kerid – is a volcanic crater about 3000 years old. 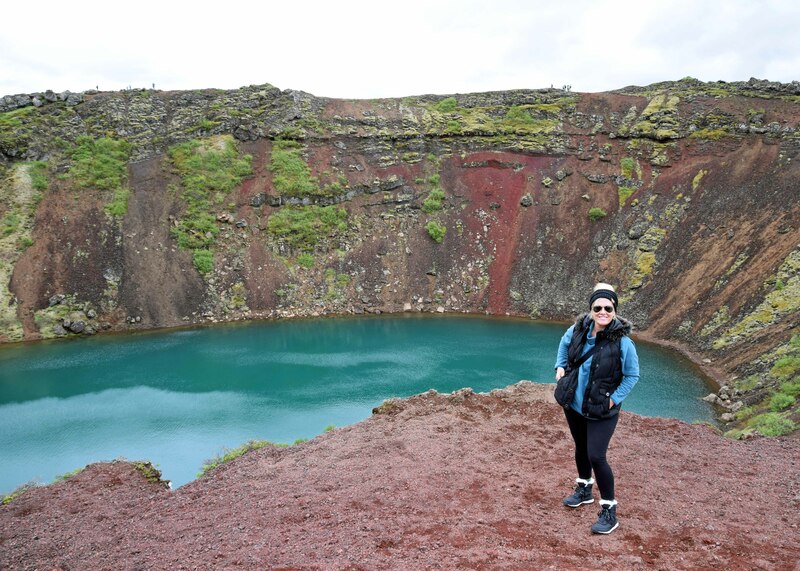 The striking, red volcanic rock walls frame the water in the bottom — milky turquoise because of the minerals in the soil. It’s one of those spots you find yourself just staring at — it doesn’t look real. In this photo, you can see tiny specks of people near the water. 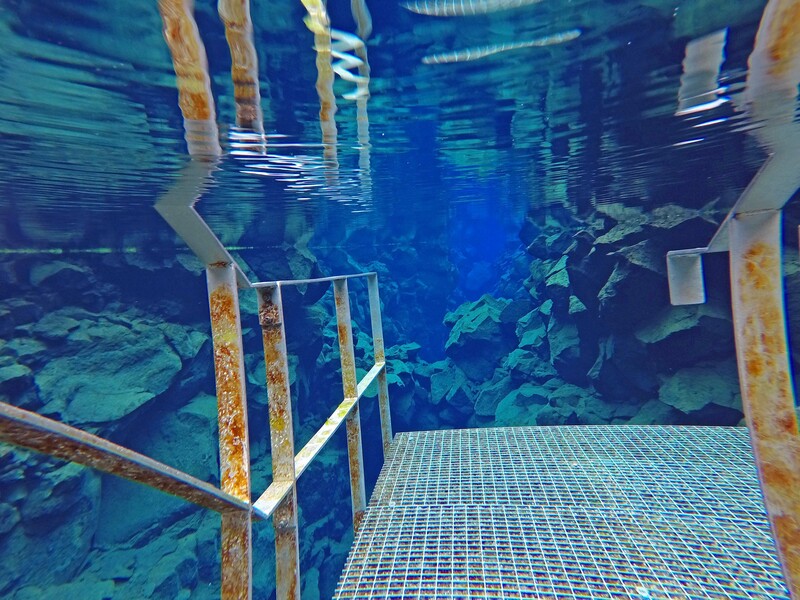 There’s a looooong staircase to get down to the bottom and face-to-face with the water. We climbed around the rim instead. Having traveled together in Europe, Jenni and I have seen our share of churches — but most iconic churches in Europe are cavernous, ornate, towering structures. 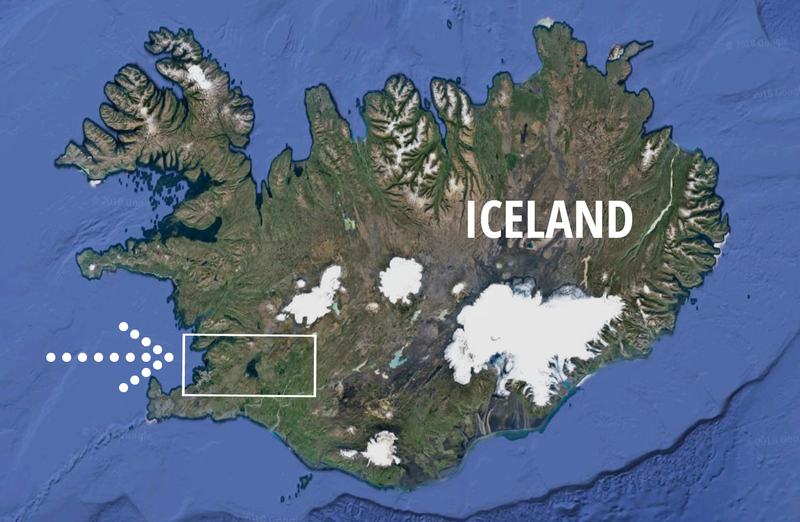 In Iceland, they’re little cottages. 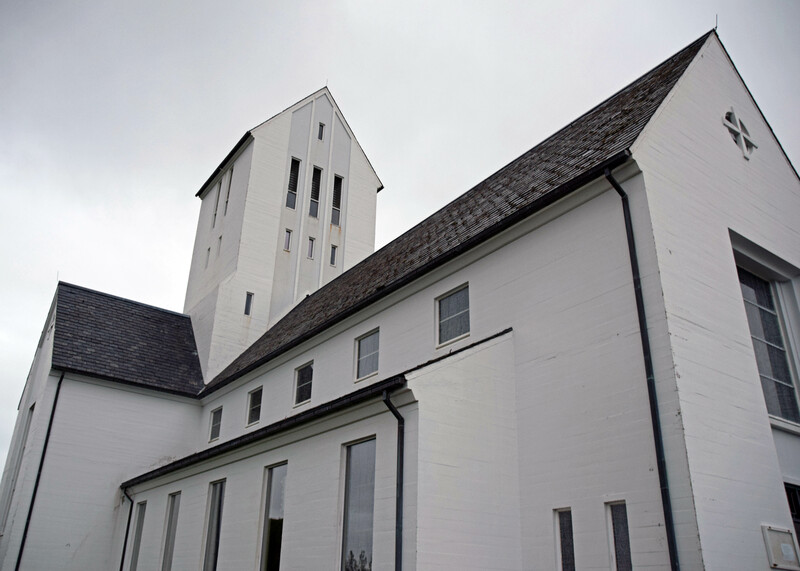 With such a small population, and a minimalist culture, their churches reflect that. The countryside is dotted with tiny, community churches that hold a few dozen people each. This one, Skálholt Cathedral, is on the bigger side and has quite a history. 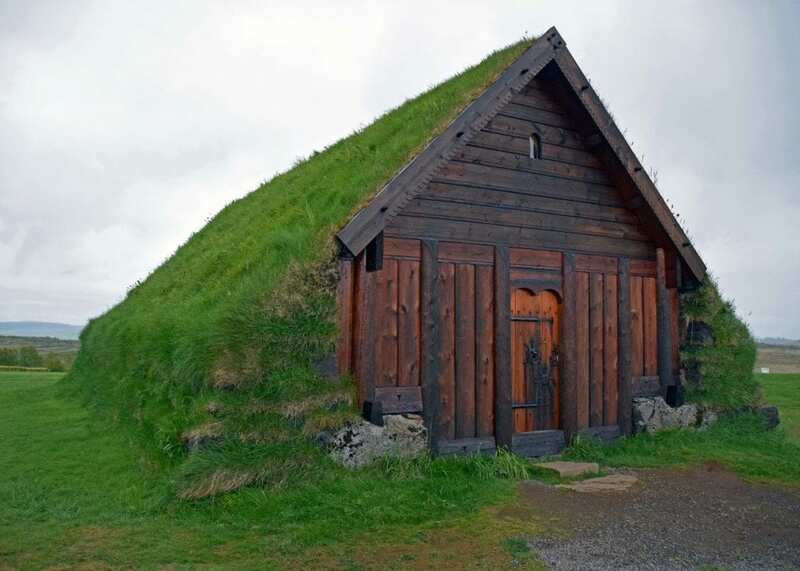 While this structure has only stood since the 1950s, it is built on a site of 9 previous churches going back 1000 years as part of the Church of Iceland. We were there quite late at night and the doors were locked, but I wish we’d been able to see the stained glass and basement museum to learn more of the story of this beautiful place. Parsonage? This turf house stands beside the cathedral and without explanation from the museum we decided it must be the parsonage. It’s one of the larger turf houses we saw all week. 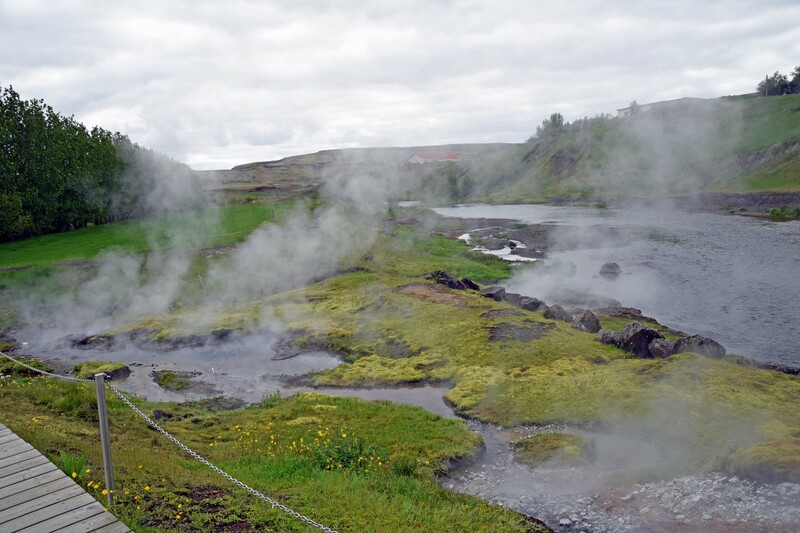 Again, at the top of the “must do” lists — thermal pools. I read an article a few weeks before our trip that described thermal and swimming pools in Iceland as the equivalent of American coffee shops. 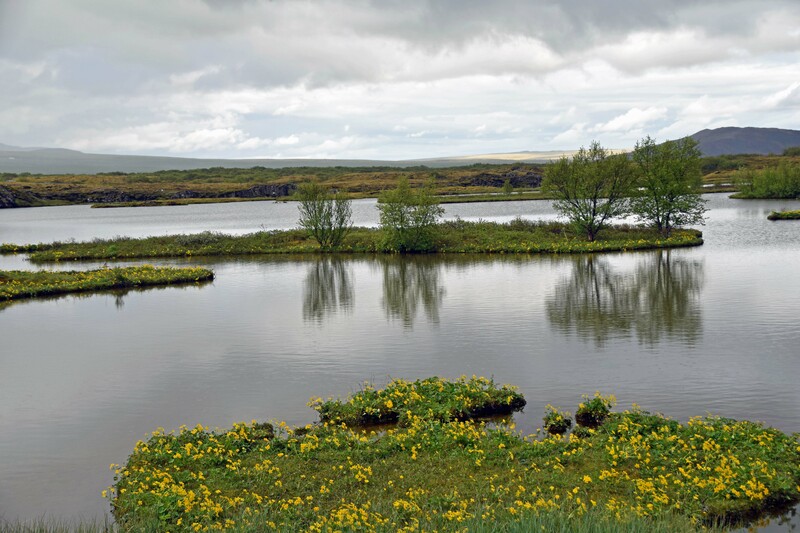 They are social gathering places where Icelanders go to relax and connect. And they are EVERYWHERE. 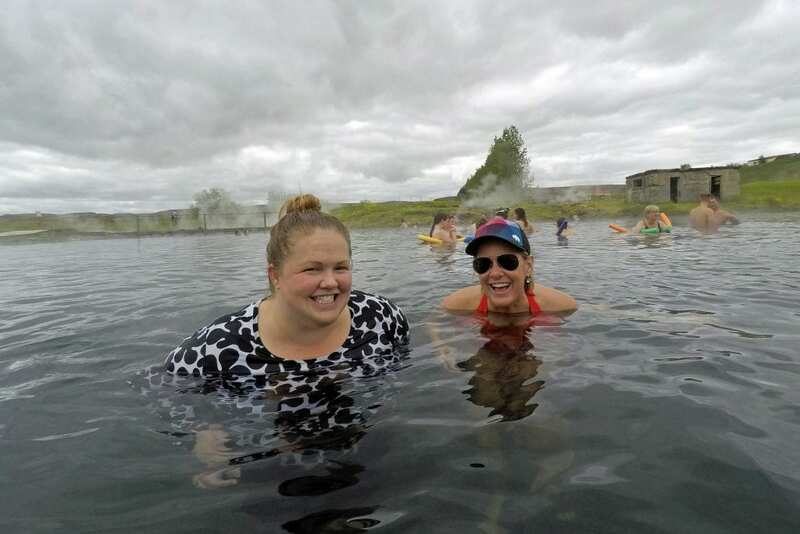 The Blue Lagoon is perhaps the most famous thermal pool in Iceland, but they are in every town and community across the country. Many are fed by underground thermal activity and some are what we know as swimming pools — but they are all an integral part of the culture. 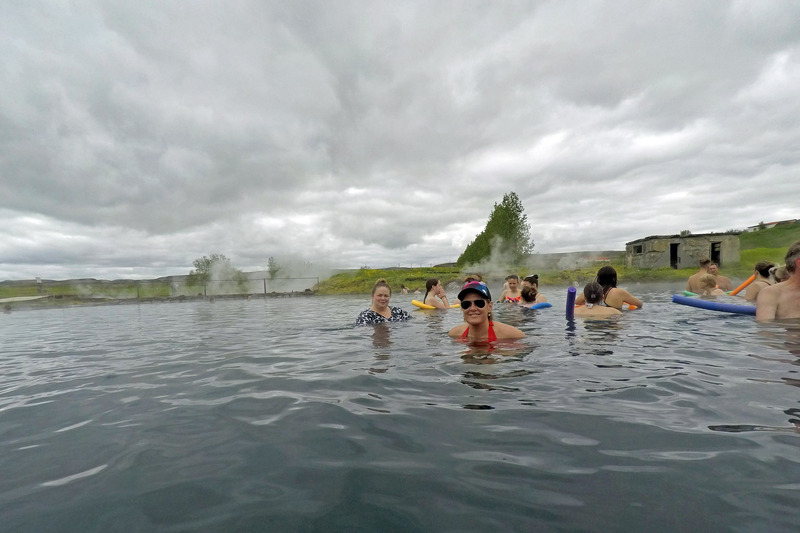 The thermal pool we visited was the Secret Lagoon at Flúðir — and a cultural experience it was. We showered before getting into the pool naturally heated by the hot springs steaming all around us. The edges of the pool were much warmer and the temperature throughout was ever-changing so we kept moving to find the right level of heat. Presumably, the lifeguard gets cold? The one on-duty the morning we swam was wearing a heavy winter coat, but we never saw him sit inside this little box. Around the pool, we could walk on raised platforms and get VERY close to the bubbling springs. 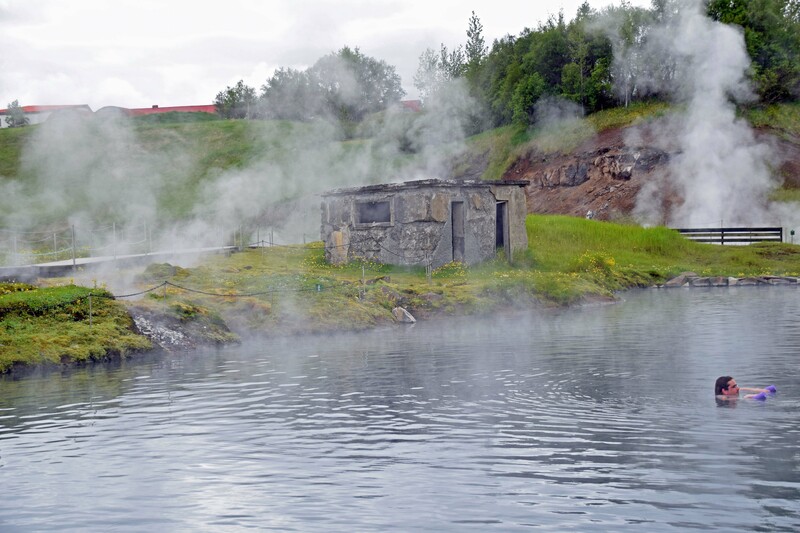 There were places you couldn’t see but a few feet in front of you for the steam — and the sulfur smell was POWERFUL. It was a social activity, for sure, as we made some new friends. A group of Canadian girls on holiday and a few ladies from the US. All around us we could hear different languages spoken by people of all ages and backgrounds. I think we could’ve stayed all day. Another waterfall? YES. 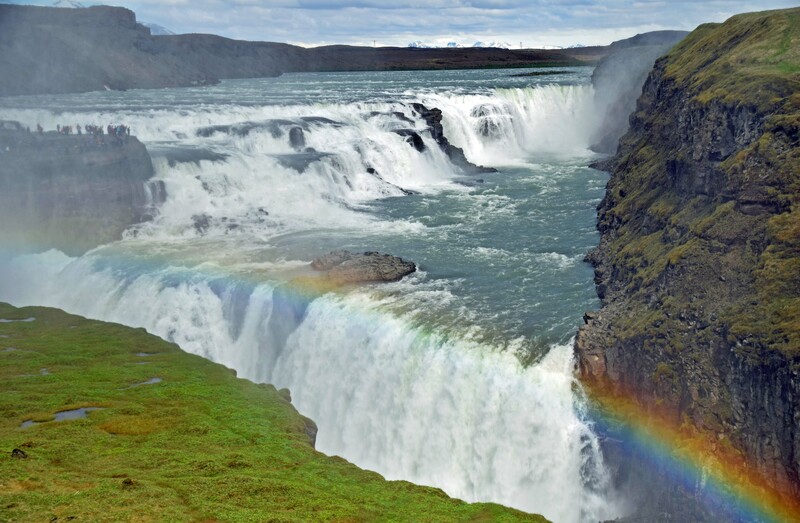 I’ve never been to Niagara Falls, but I heard people all around me at Gullfoss making the comparison. 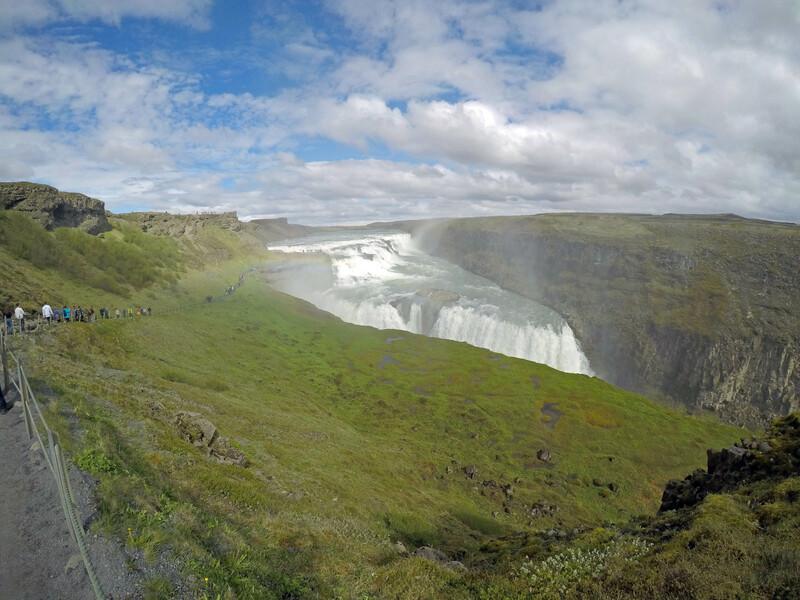 Gullfoss drops twice and is over 100 feet tall — and as you can see from the photos — the spray is incredible. And we finally saw a rainbow! 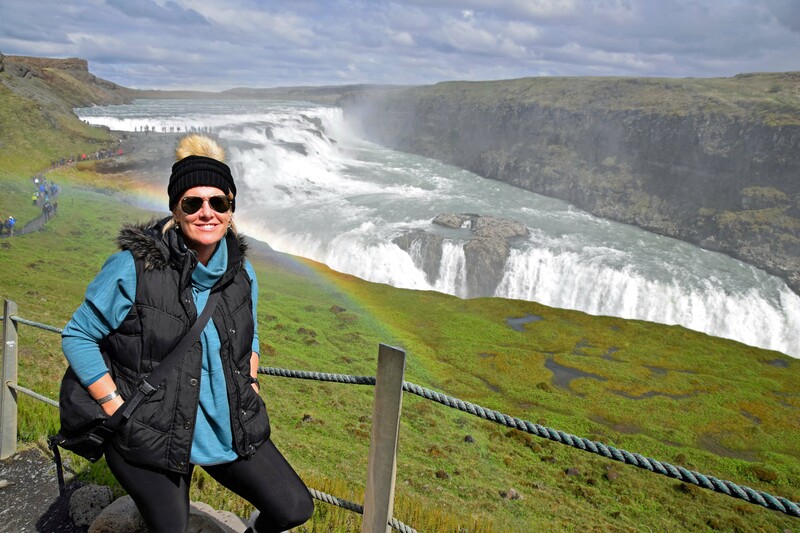 The sun was shining nearly this entire day and we saw an incredible rainbow at Gullfoss. Thing I learned while visiting Iceland: Iceland invented geysers! Almost. 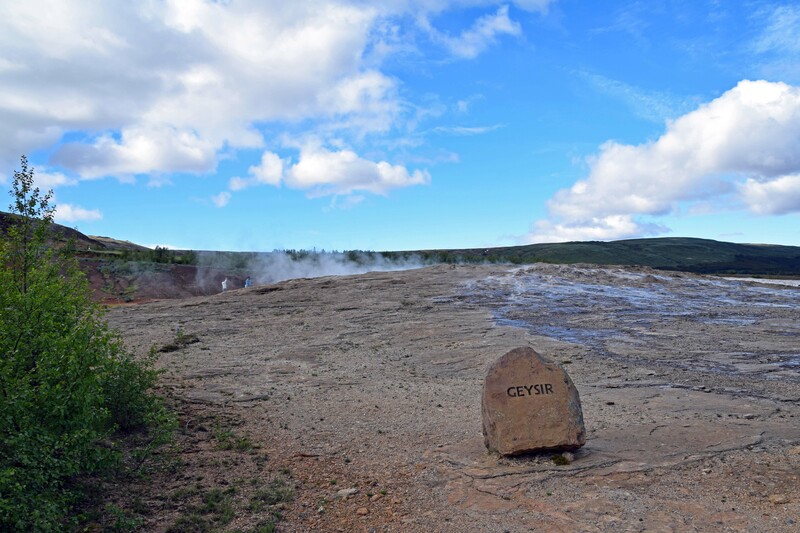 This geyser — name Geysir, or The Great Geysir — was first discovered in 1294 and is the oldest known geyser on the planet. 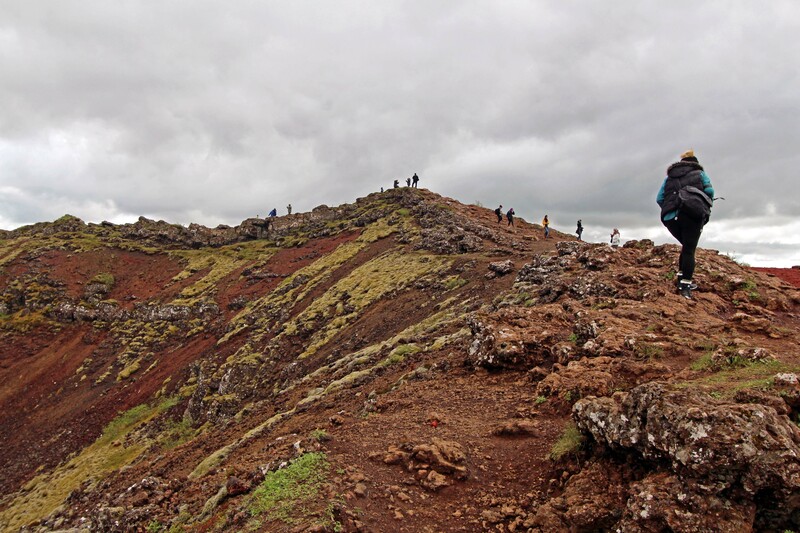 It hasn’t erupted with regularity in many years — and not at all since 2016 — but back in 2000 a series of earthquakes caused it to erupt non-stop for two days! 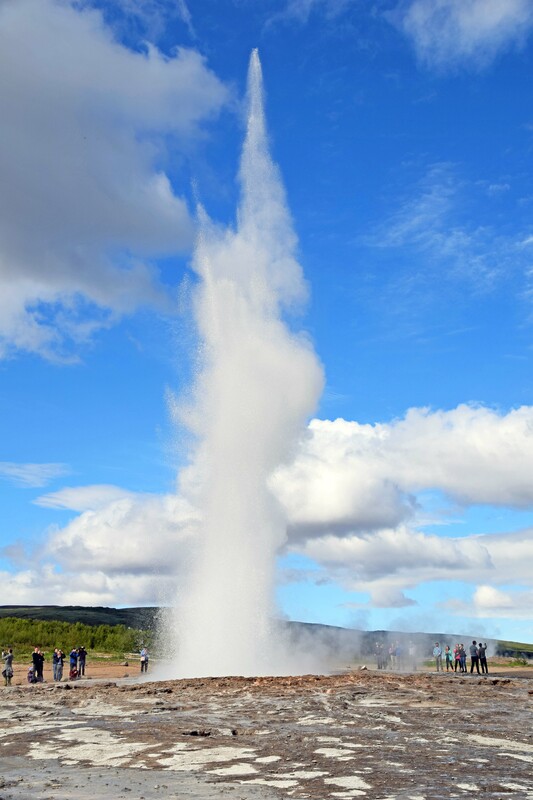 The good news — for geyser spectators — is that Geysir has a neighbor, Strokkur, that erupts every 10 minutes! 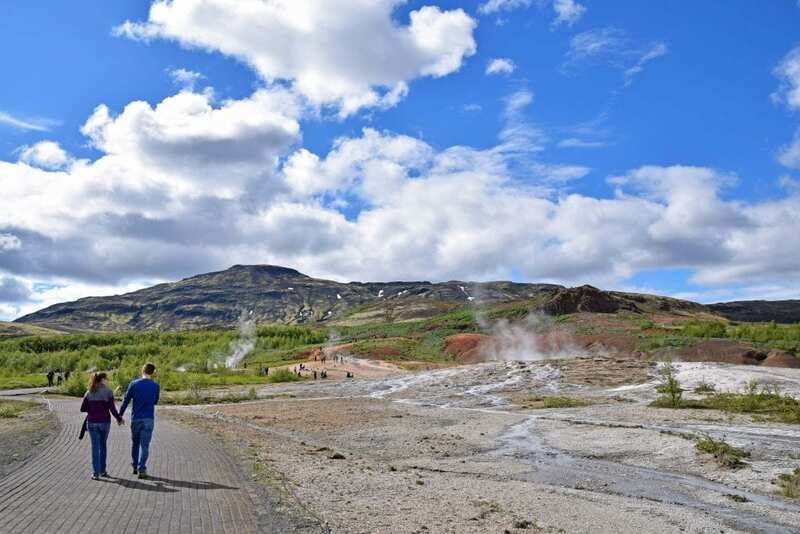 We oohed and ahhed at Strokkur several times before we got back on the road. 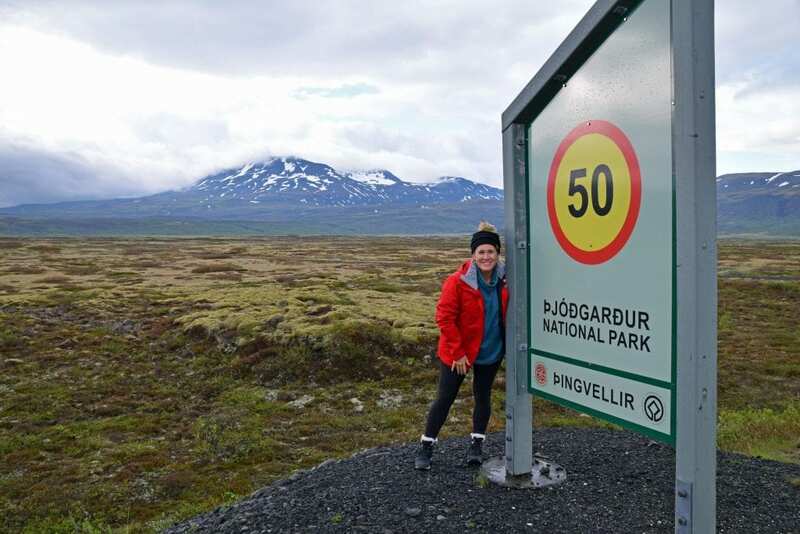 This is an… unofficial stop on The Golden Circle, but one we visited twice and highly recommend. Efstidalur is a restaurant + hotel + dairy + agriculture coop + riding stable. And I can’t believe I didn’t take a photo of the adorable outside of the barn-like building. I DID take a photo of the delicious hamburger I ate while these cows looked at me through the window. And we came back later for ice cream. We weren’t there long either time, but it was charming and delicious and a perfect stop during our road trip. I’d heard stories. And I’d seen photos. But I thought they’d be hard to spot, for some reason. Let me tell you, Icelandic horses are everywhere. 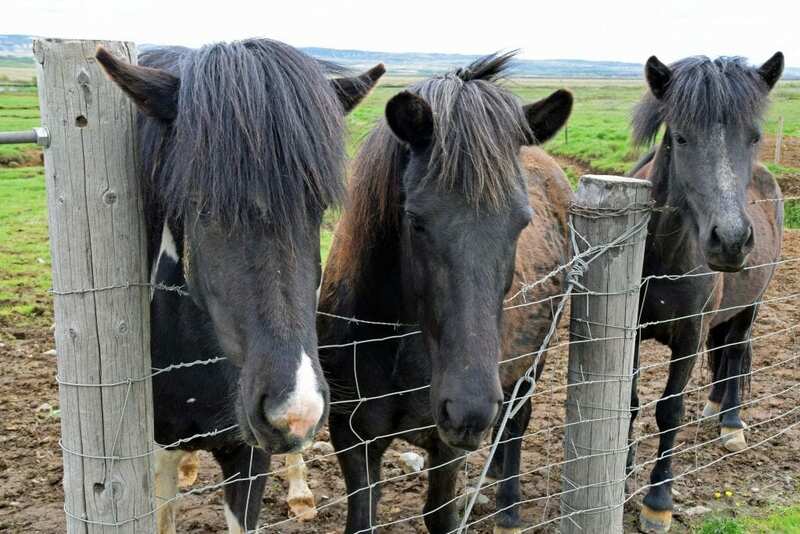 As we drove, there were fields and fields of horses (and sheep) and even though they’re fenced they just look WILD. I knew I wanted to pet one. 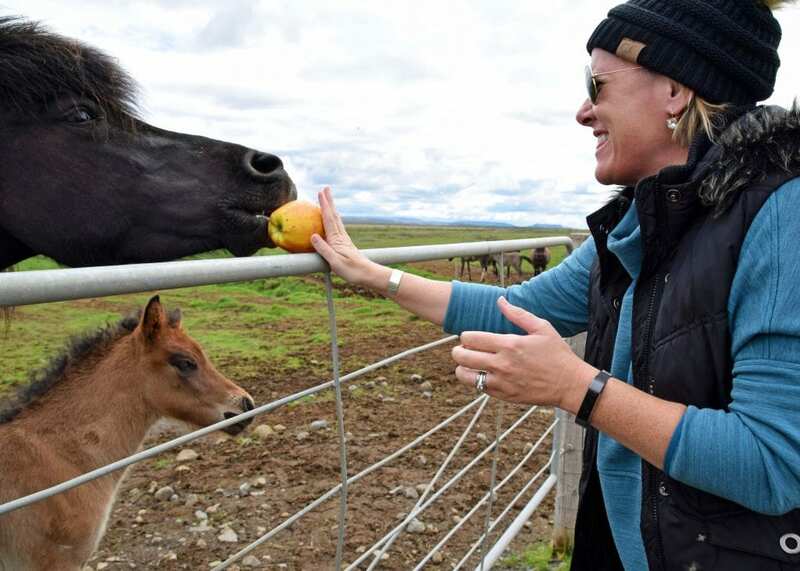 At one of the guesthouses we stayed in, I asked the proprietor at breakfast if I could have a whole apple — for the horses. And she brought me the biggest apple I’ve ever seen. I offered it to this poor horse and it couldn’t even open its mouth wide enough to bite it! What a mess. 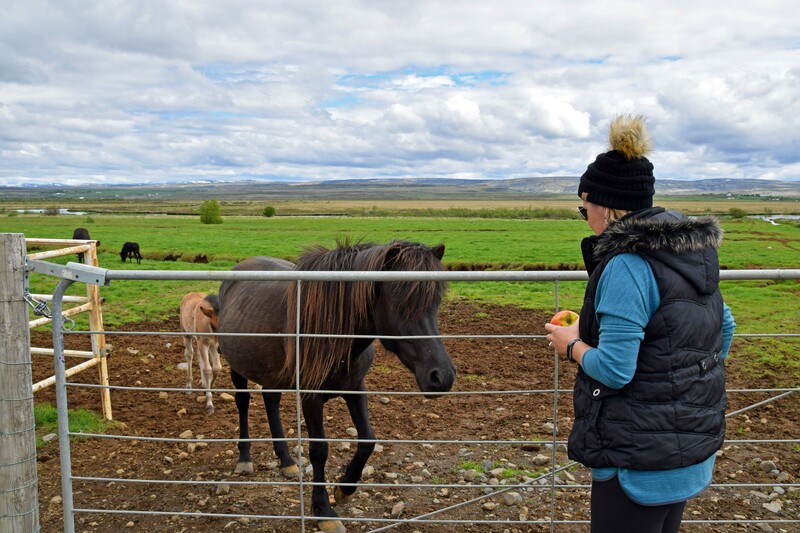 The poor thing chomped at it as the apple squirted juice all over both of us, and it finally fell to the ground where several horses proceeded to fight over it. 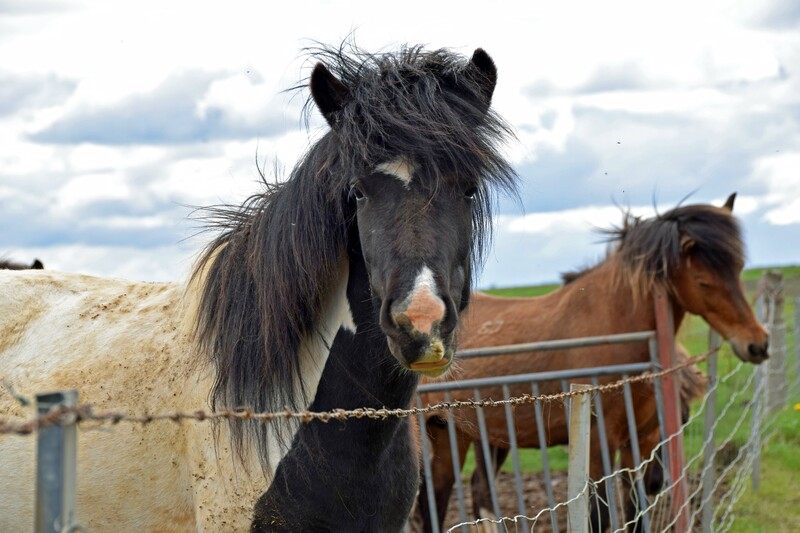 This horse is judging my city-kid, horse-feeding abilities. And then there’s this! 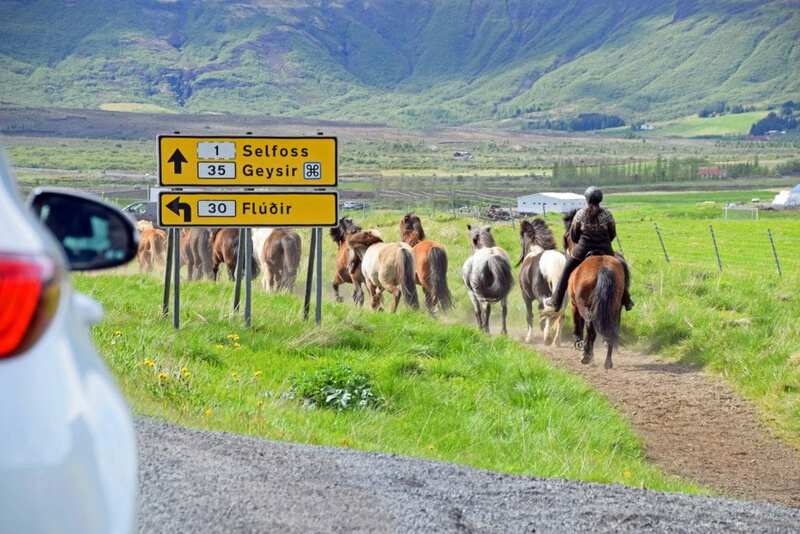 A herd of horses, being moved down the road from one pasture to another — and going all Iceland on us in the middle of the road! We were stopped when I took these photos, but the boys herding the horses down the road didn’t seem phased one bit by this scene. 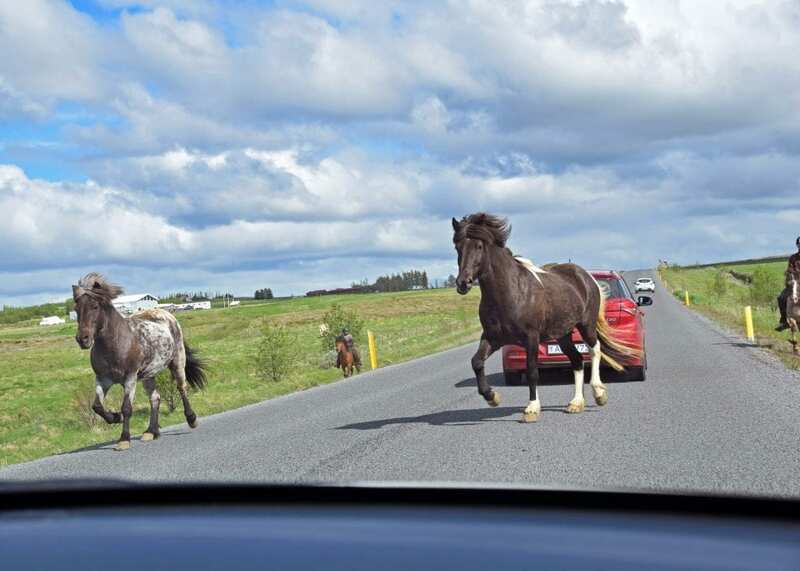 As if they casually move horses down the middle of the road whenever they need to! 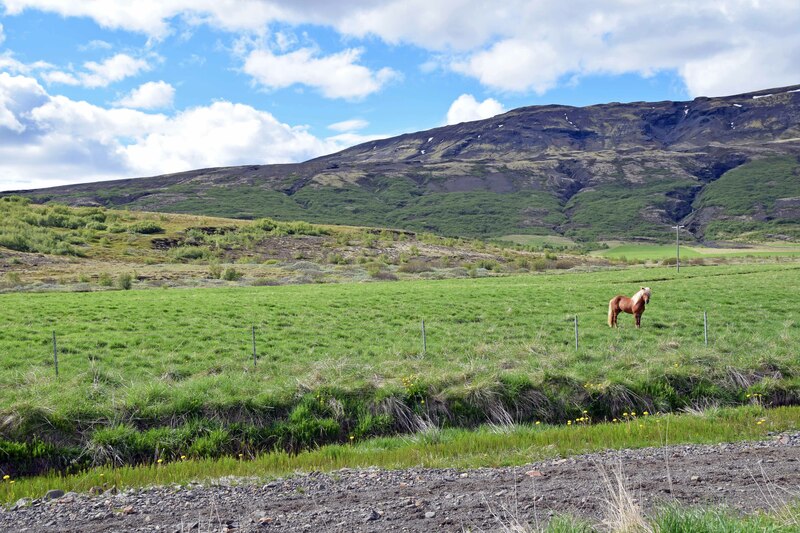 The last major stop on The Golden Circle is one of Iceland’s national parks. And we couldn’t stop without grabbing a photo by the sign — as is tradition in our family with US National Parks! The time we spent in Thingvellir was the dreariest weather we’d seen all week — it actually rained for a bit and we waited it out in the car. Once it slowed to a sprinkle, we ventured out into the park on foot. 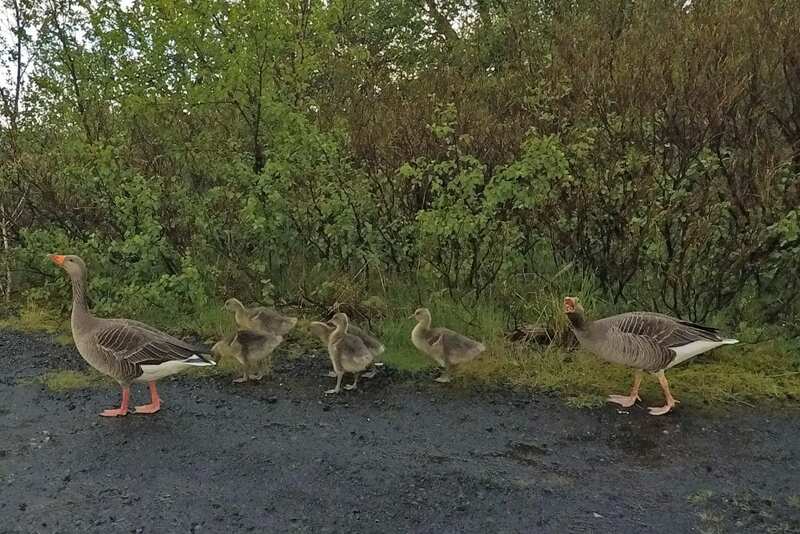 As we walked, we watched a few families of ducks enjoying the rain. 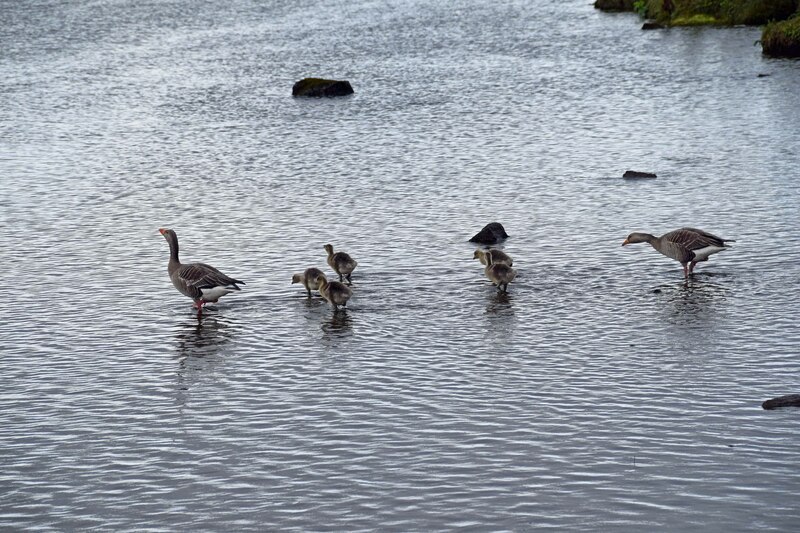 And as I stalked a cute little duck (goose?) family into this pond with my camera — THIS GUY decided to crash my party. I almost fell in the water trying to simultaneously take photos around him and not disturb the ducks! 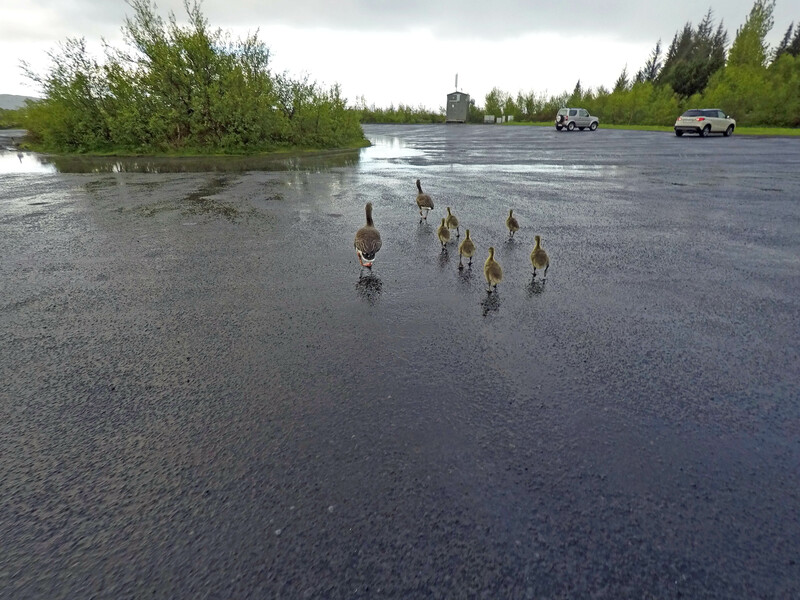 But when it came to disturbing the ducks, I was just getting started… I switched to my GoPro because the rain was still coming down a little and I sometimes forget how close I am to things with the GoPro’s wide angle. 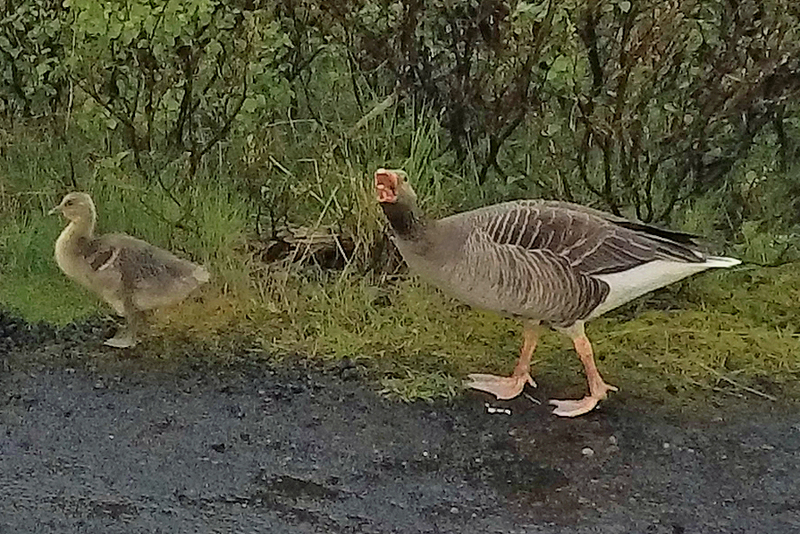 So before I knew it I was too close for comfort to this poor goose and it hissed at me! Back off, camera lady! We eventually wandered over to the spot we most wanted to find in the park. 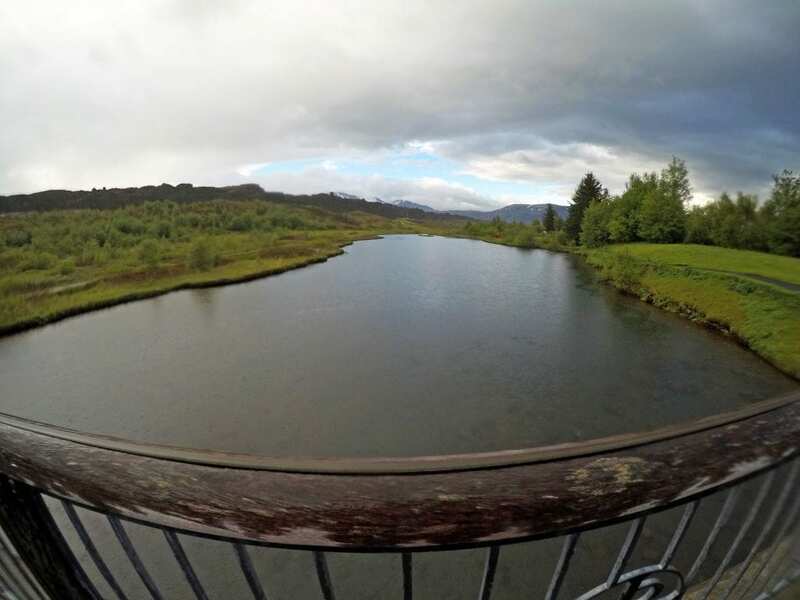 Silfra — the spot where the North American tectonic plate (on the left) meets the Eurasian tectonic plate (on the right). It claims the clearest water on the planet — and you can scuba dive right there between the plates. 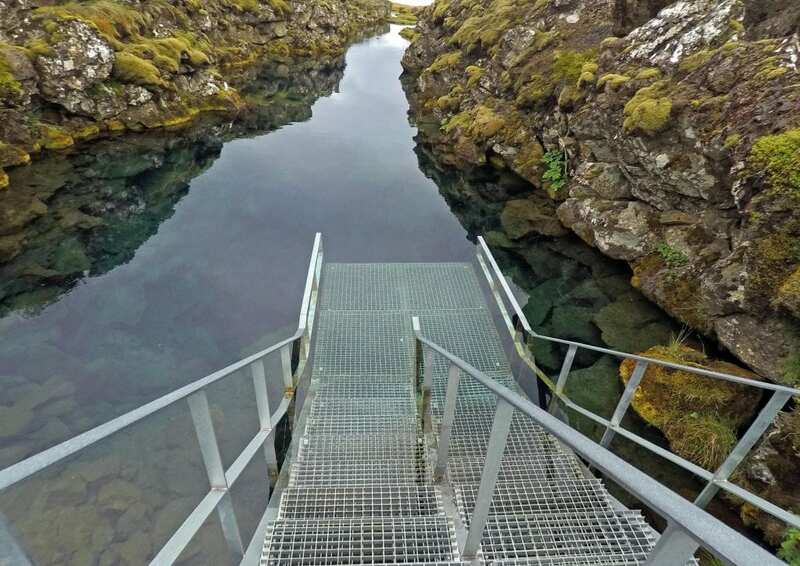 We hadn’t made plans to dive — and the water was only 2 degrees above freezing — but I walked as far down as I could on the steps and stuck my GoPro under the water to try to capture the clarity of the water. And whoa! Even with a simple camera like that, the clarity of the water is incredible — look how far you can see! It was just a taste of Iceland, but a delicious one for certain. 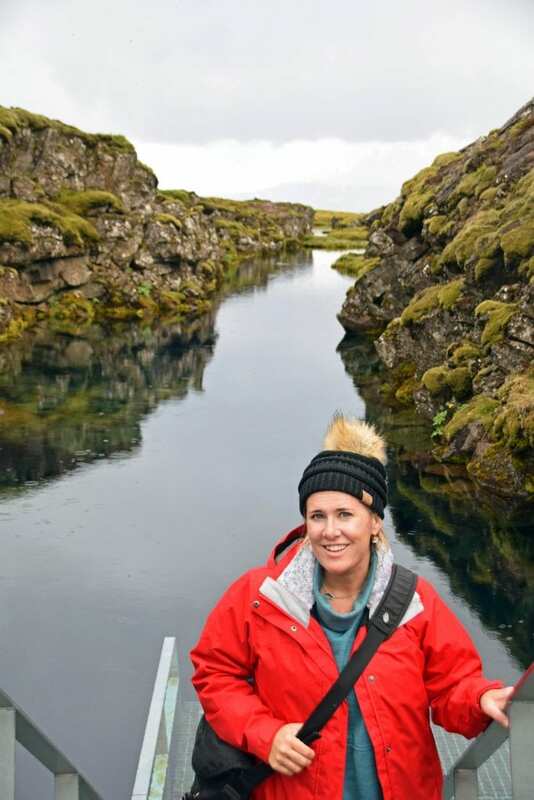 With our tour of the South Coast and our puffin-hunting adventure to the Westman Islands, and our trip around The Golden Circle — we squeezed every drop out of our time in Iceland and we’re already dreaming of going back.